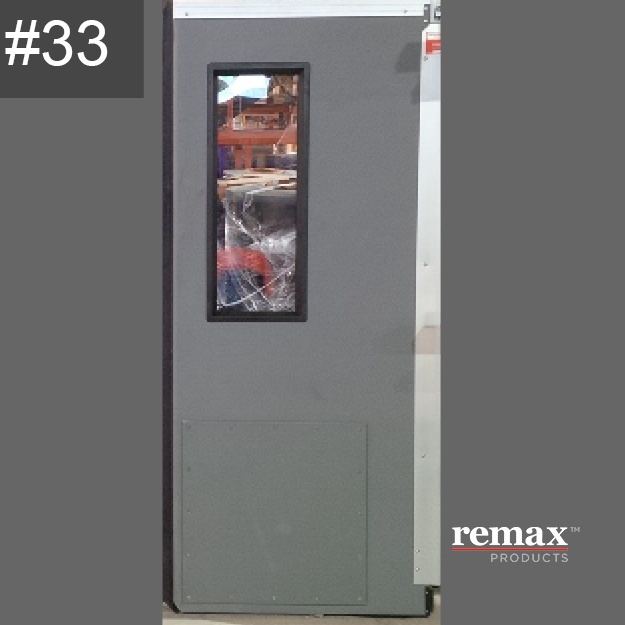 Welcome to the Remax Stock Clearance list! We have accumulated some surplus stock that we must clear as soon as possible. 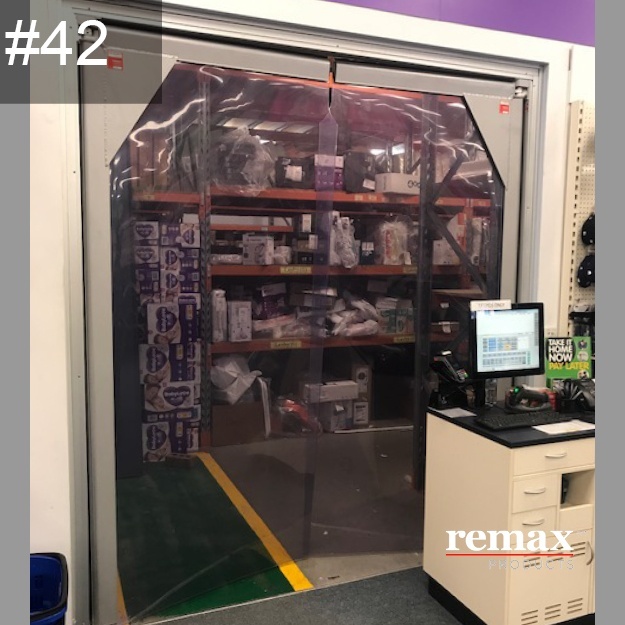 We know that sometimes the budget will only stretch so far, so here we have created a list of special deals on doors and screens that we are able to clear out at crazy prices. This stock is mostly brand new that we have accumulated either through order cancellation, incorrect sizes, or a product that we have been testing. We’ll pass on the balance of warranty on all these items so you can rest assured your bargain wont bite you! 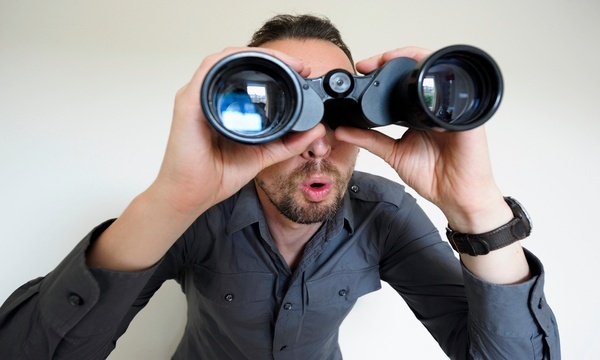 If you can't see anything to match your opening size, ask us about modifications to suit. If you would like more information on any clearance products, please fill in the form to the right with your query. *Installation Price - ESTIMATE subject to site evaluation, location etc. NB: Some images shown are a guide only - actual product may differ slightly. No Discounted Air Curtains Remaining. Enquire within for a quote for new Ambient Air Curtains and Heated Air Curtains. 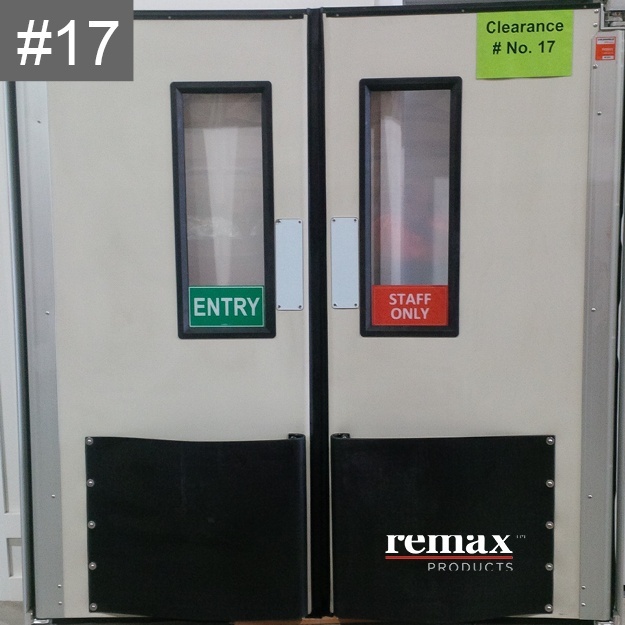 Clear pair of doors with opaque to 1200H. On gantry. Please note, photo above is not the actual product, sample only. One Single Double Acting High Impact Insulated swing door, grey, with grey kickplates and black window frame. Double glazed polycarbonate windows. Full anodized aluminium frames and self-lubricated low-maintenance mechanisms. Matching second single swingdoor available - see No. 29 Above. Suitable for: temperature controlled zones, high activity, access by trolleys and pallets, supermarkets, retail, warehousing, processing, offices, hotels, restaurants, kitchens, corridor segregation and more. 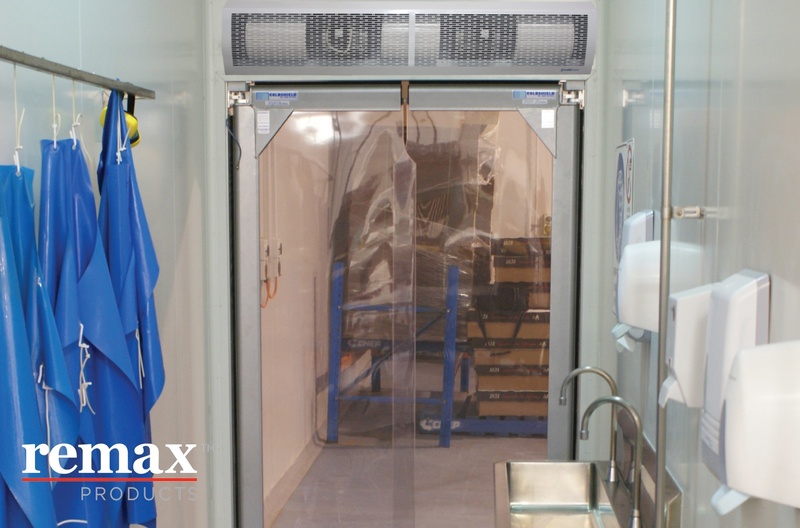 Originally manufactured to be installed in a butchery but were removed the day after installation as the client changed the process line. A fantastic bargain to purchase new doors for more than 50% less than the retail price. 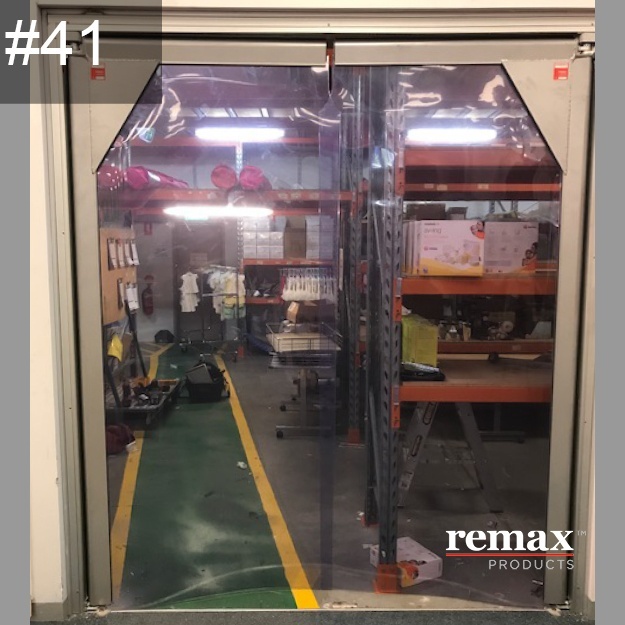 One Single Double Acting High Impact Insulated stockroom swing door, kosciusko panels, with grey buffer and window frame on one side and yellow buffer and window frame on the other side. Double glazed polycarbonate windows. Self-lubricated low-maintenance mechanisms. Suitable for: temperature controlled zones, stockrooms, high activity, supermarkets, retail, warehousing, processing, offices, hotels, restaurants, kitchens, corridor segregation and more. Originally manufactured to be installed as a stockroom door. 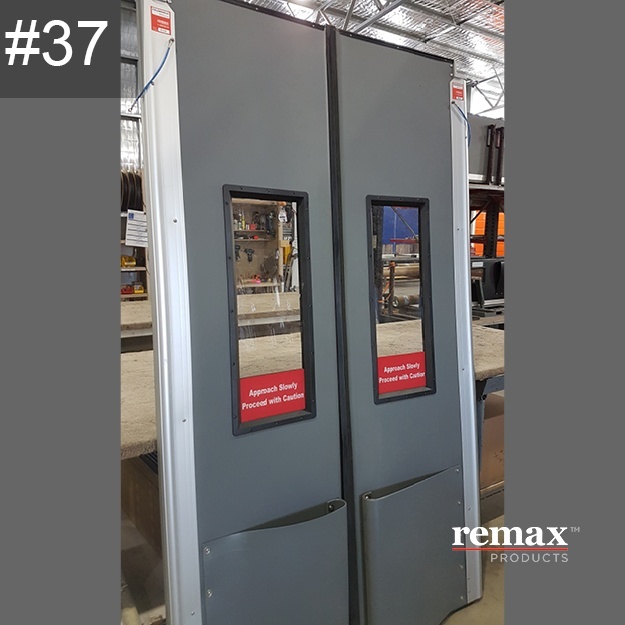 One Pair Double Acting High Impact Insulated swing door, Kosciusko panels, with black spring buffers and integrated signage, stainless steel push plates. Double glazed polycarbonate windows. Self-lubricated low-maintenance mechanisms. Suitable for: temperature controlled zones, stockrooms, high activity, supermarkets, retail, warehousing, processing, offices, cafe, hotels, restaurants, kitchens, corridor segregation and more. One Pair Double Acting High Impact Insulated swing door, coffee cake colour panels, with matching spring buffers. Double glazed polycarbonate windows with black frames. Self-lubricated low-maintenance mechanisms. Including full support gantry frame. One single double acting high impact insulated swing door. Kosciuszko coloured door panels. Poly carbonate windows with black frame on one side and yellow frame on the other side. Grey buffers. Hinge Plate. Size: To suit DLO 2460H x 988W. 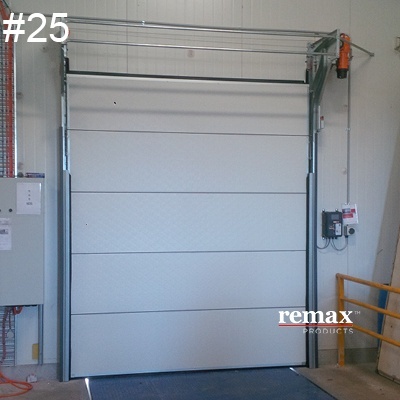 If gantry frame required- to suit a completed opening of- 2515H x 1098W. 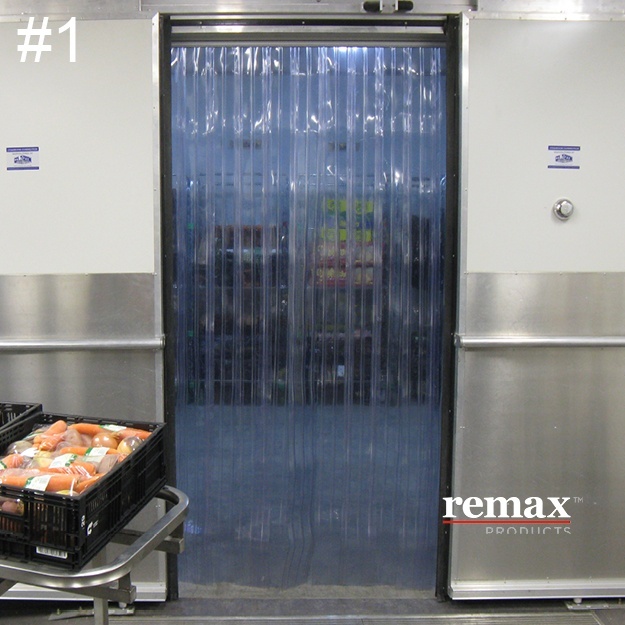 One pair 4500 Series Coldshield double acting high impact insulated swing door. Grey coloured door panels. Poly carbonate windows with black frames. Grey, matching buffers. Hinge Plate. Signage incorporated into the windows (Approach Slowly, Proceed with Caution) in white text on red background. 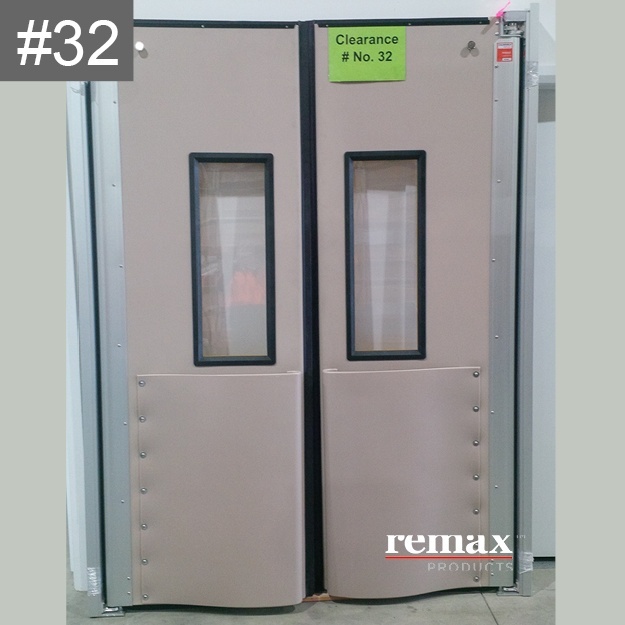 One pair 4500 Series Coldshield double acting high impact insulated swing door. Black coloured door panels. Poly carbonate windows with black frames. Black, matching buffers. Hinge Plate. Size: To suit DLO- 2484H x 1706W. If hinge plate is sufficient- to suit a completed DLO- 2429H x 1596W. Car showrooms, garages, residential, commercial and more. 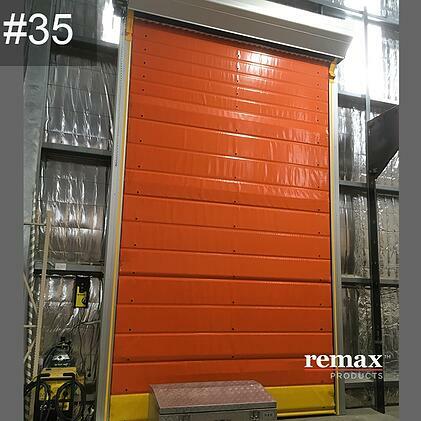 Movichill Cool room Rapid door, orange insulated curtain, coolroom door for temperatures down to 0 degrees, can be trimmed and adapted to fit a smaller opening. 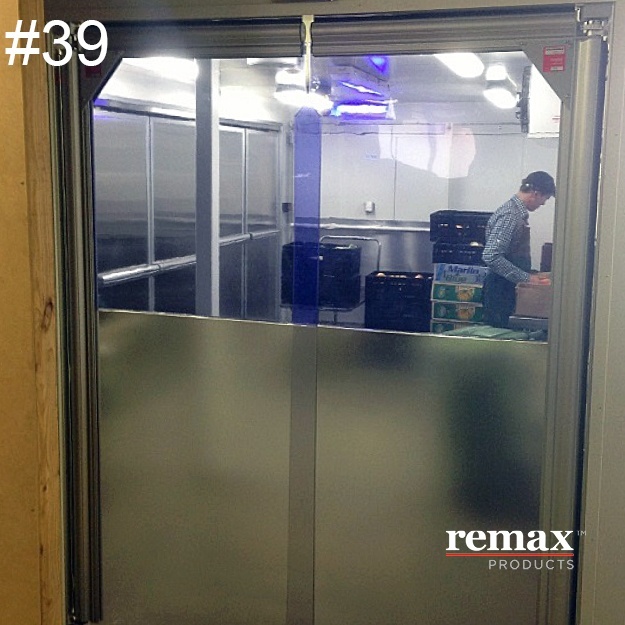 Coolrooms, storage, refrigeration, cold storage and more. 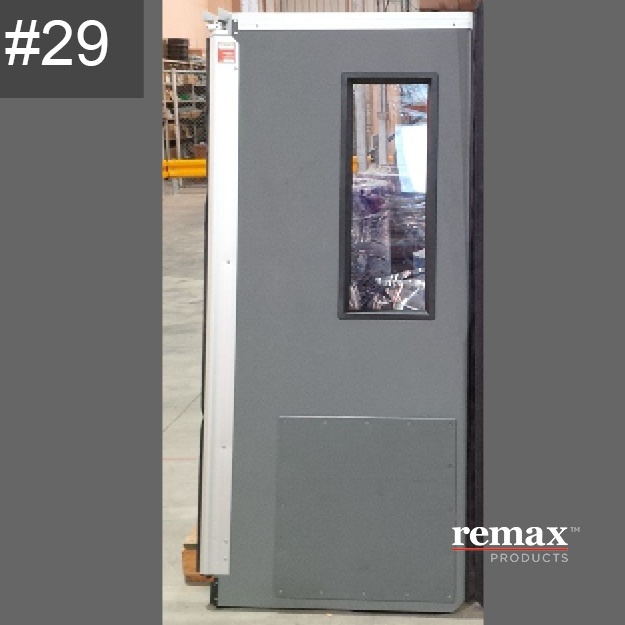 One Single Double Acting High Impact Insulated swing door, grey, with grey kickplates and black window frame. Double glazed polycarbonate windows. Full anodized aluminium frames and self-lubricated low-maintenance mechanisms. 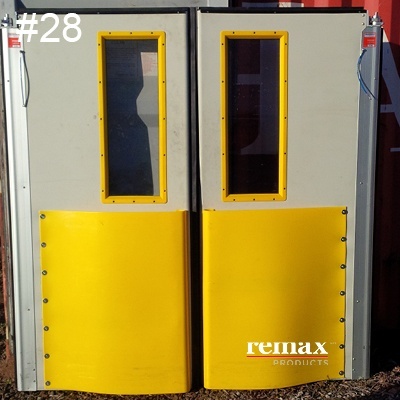 Matching second single swingdoor, Item No. 33.
swing doors, grey with matching grey 600H spring buffers to resist impact. Condition: Secondhand. Used for a short time. Scratches to the lower corners/buffers. 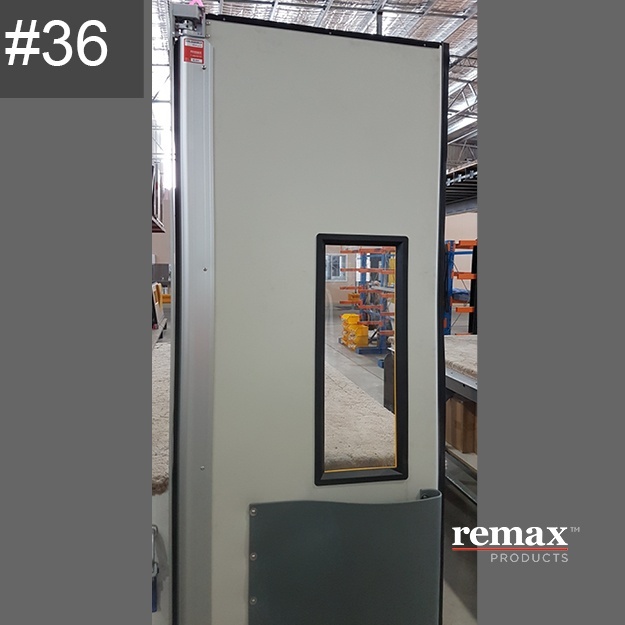 Insulated SwingdoorDouble Acting High Impact Insulated swing door, white, with buffers and gantry frame. 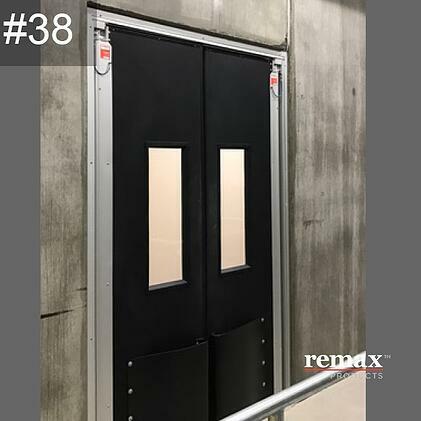 Descriiption: One Pair Double Acting High Impact Insulated swing door, black (abyss) panels, with black spring buffers. Double glazed polycarbonate windows. Self-lubricated low-maintenance mechanisms. With gantry frame. swing doors, grey, with impact buffers and gantry frame. 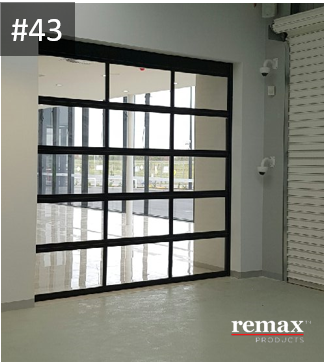 swing doors, grey, with impact buffers and hinge plates. 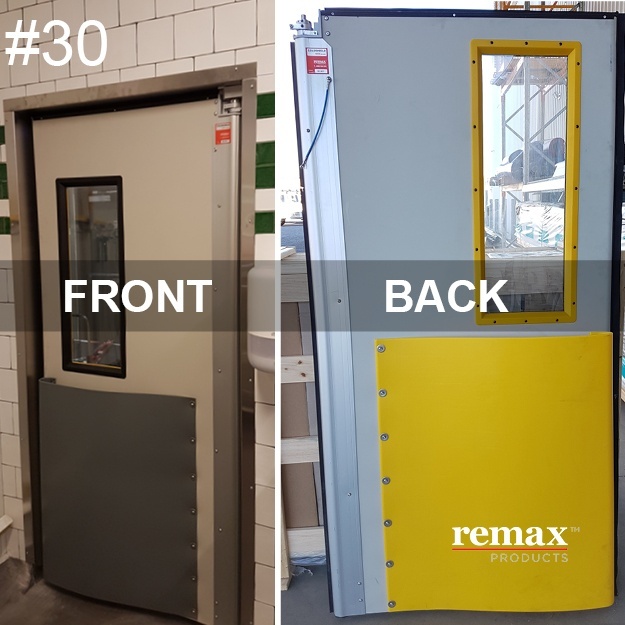 Double Acting High Impact Insulated swing door, white, with yellow PVC buffers and yellow window frame. Movidor HS25 Rapid Roller Door, 3-phase, DOL starting, internal use only, mesh Windows. 200mm ribbed clear PVC strip door. Suitable for: kitchens, supermarket, retail, butcher, cafe, restaurant, manufacturing, food processing and more. If you can't see anything to match your opening size, ask us about modifications to suit. If you like more information on any products, please call us on 1800 010 221 or fill the form below to request a call back.